When I was learning science in high school, I was mesmerized by the notion that scientific facts were true, myths were false, and there were still things that needed to be „figured out“. I was very impressed by the way computers were all about 1’s and 0’s (it wasn’t until much later that I learned computers didn’t actually divide truth and falsehood quite that neatly). Several years ago, I made a graphic image that shows the difference between the way it appears that humans think vs. the way it appears that computers think. Note that I didn’t label which side represents human thinking vs. computer thinking. 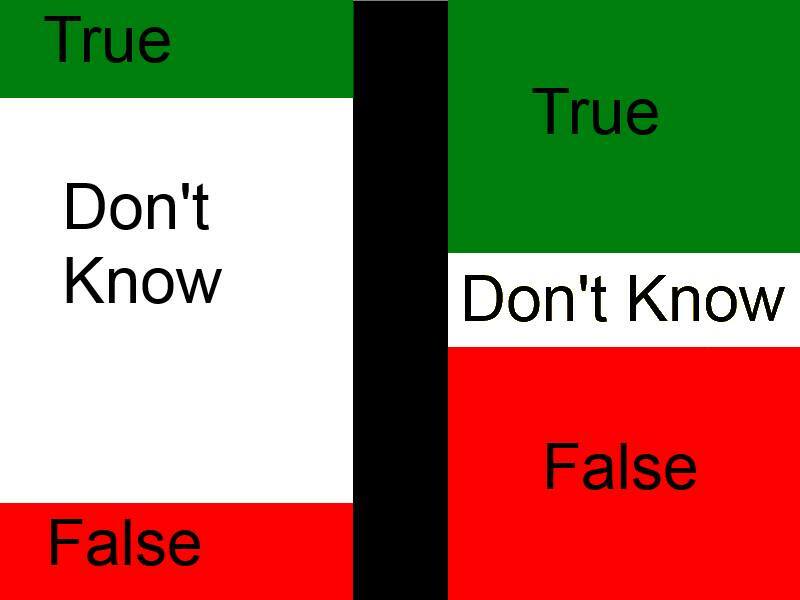 What we usually experience when we use computers is either TRUE or FALSE – we are not normally aware that there is actually a „DON’T KNOW“ state in between those two extremes. About a decade ago, I was very adamant about three-state logics. Several decades ago, when I was just embarking on dissertation research (which was never finished, but that story is beyond the scope of this article), I was very adamant about something called „modal logic“ – a field in philosophy (and linguistics) which focuses on human modes of thought (such as „knowing“ vs. „believing“). Since humans often make references to such modes, I was hoping to unlock a hidden treasure behind such concepts. Yet they remain elusive to me to this day, even though I may quite often be heard to utter something like „I think…“ or „I believe…“ or indeed many such modes (usually using so-called „modal verbs“). I think the less room we allow for such modalities – the smaller the amount of space we make for cases in which we acknowledge that we really don’t know, the more likely we are to make mistakes / errors. Statisticians might be very cool to acknowledge „type 1“ and „type 2“ errors without even batting an eyelash, but for most regular folks it makes a world of difference whether we want X, whether we fear Y, whether we hope or wish or whatever. Such very human modes of thought are rampant in our everyday lives and thinking, yet they are not given very much (or even any) room in the computer world. When there is no room whatsoever for „maybe“, then I predict the algorithms processing the data will probably be wrong. This entry was posted in freezine and tagged binary logic, certain, certainty, computer, don't know, false, falsehood, human, language, linguistics, logic, modal logic, modal verb, modal verbs, mode, modes, natural language, natural science, nature, philosophy, rational, rationality, remediary, science, scientific, think, thinking, thought, thoughts, three state logic, true, truth, uncertain, uncertainty. Bookmark the permalink.